Do you have a JOY list? The definition of joy is a feeling of great pleasure and happiness. I have came across the idea of a “JOY List” several times in my past and asked myself “what is life if we do not experience joy”? When I was learning to change my eating habits, I would go to my list of healthy alternatives, choosing something from that list rather than fall back on my old, less healthy habits. But my list needed to include things I enjoy doing because I REALLY like Twinkies. When I was stretched for money, I would pull out the FREE list. When I had some money to spare, I would go to the “this costs me some money but I’m worth it list”. And the more I have used a Joy List, the more I’ve come to realize that JOY = SUCCESS. YOU are responsible for creating your own joy. There’s no need to wait on someone else to provide it. Keep your own happiness and wellbeing in your own hands, where it belongs. I suggest adding 1-3 things to the list each week. Sometimes I find myself in a down mood or feeling negative & I go to my joy list. The more you are joyful, optimistic, hopeful etc, the more people, resources and opportunities will be attracted to you. My coach Tiffany Peterson with The Light House Principles has been a great resource for me in my home based business. I am an RN (Registered Nurse, but I also see myself as a Relationship Networker or Relationship Nurturer), and whether I am involved in community volunteering with Frisco Women’s League, networking at the North Texas Moms in Business group, or attending church at Hope Fellowship, my goal is to build relationships and be of value to others. Check out Tiffany’s website, blog & videos for more ideas that have inspired me. Frisco is full of JOY, let’s take a look at some ideas. Your list may look different. The point is to find those things that give YOU joy, and do more of those things. Coloring Barnes & Noble has tons of coloring ideas for adults. Send a note of encouragement/thanks/hello to someone. Call a friend. Make connection calls, reconnect & be genuine. Watch a funny show/video clip. Laughter always lifts the spirits. Take the dog for a walk at the Frisco dog park . Facetime a special someone you don’t get to see often (for me that’s my grandson). Find a way to save money. Give to someone (time, attention, item, money). Go to a movie YOU want to see at Cinemark Frisco Square. Walk at the park to your favorite tunes (Frisco Commons/Hope Park). Take a stroll down Frisco Main Street & visit the shops. Look into Acupuncture/Aromatherapy/other holistic therapies. Lay out by the pool. Go for a haircut/color (try something new). Make time at least 1-3 times per week to do something for yourself. It doesn’t have to be costly, but it does need to bring you joy. Make your own list now. Make it a great day & enJOY! The next thing I remind first-time entrepreneurs is that by starting a business, you have made a decision that does not allow you any time, in your first year, to do anything but build your business. No more binge watching Game of Thrones. You are not allowed to watch The #AskGaryVee Show going forward (maybe…). No more late night parties with your friends. You are in such a Code Red zone that every minute (let’s call it 18 hours a day if you want this to be successful), needs to be allocated for your business. This even includes time with your family. It’s a substantial sacrifice and you have to realize the level of commitment that is required. I have a whole Pinterest board filled up with work-out plans, diet ideas, and all kinds of crazy cute athletic clothes. Who wouldn’t pin a tank top with an adorable cat lifting dumbbells with the words “kitten my swole on?” I have enough Motivation Monday quotes to last me the whole week, and enough exercise cycle diagrams to make you tired just by reading them. But with all the planning, more often than not, I find myself in energy-saver mode where I’m pressing play for another episode of Grey’s Anatomy with a Dorito bag in my hand. Honestly, crunches just aren’t exciting, and running does not release a suitable amount of endorphins to actually make me want to do it for fun. Working out has become monotonous, and I would even stretch to call it boring. My desire is to find something that would challenge me and make me feel more like a human again than a potato. 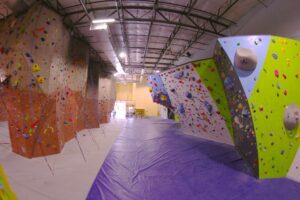 So, when I found Canyons Rock Climbing Gym, I was thrilled. They are conveniently located in the hub of Frisco right off where Frisco Street meets Technology. Upon arriving, they go over all safety regulations, and give you a quick tutorial on how to belay someone. It was simple, effortless, and easy to grasp the concept. After the quick lesson, the arena is all yours with a variety of walls that offer a great experience for climbers of any level. Each route is labeled with its grade, or level of difficulty based upon degree of incline and technical challenges, so you get to pick and choose how much you want to push yourself. Along with their routes they have a bouldering wall that was built in the spring of 2014. This wall is about 15 feet tall and is to be scaled without a harness. At first, it was intimidating but it quickly became addicting. It’s kind of a “guess and check” process of figuring out what holds work for you and which don’t, and when you fail, or finish you get to drop into the cushy crash pads that feel like nothing less than a humungous fluffy pillow. Bouldering, as well as their 5 auto-belays, make it easy to get a great physically challenging work out even if you don’t have a buddy with you. The walls aren’t all that Canyon has to offer. They have birthday party packages, summer camps starting in May, lock-ins, private climbing lessons, membership benefits, and even yoga classes. There is a lot of variety and opportunity for anyone to have an enjoyable experience. Also, their rates are affordable! For $17.00 for adults and $12.00 for 12 year olds and younger, you get a day pass, which allows you to come and go as you please for that whole day. You would also need to purchase some necessary equipment such as the harness rental from $3.00, shoes for $5.00, or the gear packages for $6.00. With their memberships, gear and classes are free, and you get to climb as much as you want. Teachers, police officers, college students, and home-schoolers have different discounts for memberships so if you are interested, check out their website and take a look at what is right for you. There is so much that this place has to offer. The staff is friendly and helpful, and the environment is motivating and energy-pumping. It is so much better than running on a treadmill for an hour, or doing a 30-day push up challenge. So really… go check them out! So here it is your excuse to buy that “fitspiration” t-shirt you found online, while you can still feel your fingers, because I can guarantee you will be feeling the process of progress in the morning. It’s time to say goodbye to the Doritos and hello to healthy as we pursue that rocking body we have always wanted while still having a fun time doing it. Is The Frisco RoughRiders Matt Bush The Next great Rangers’ Closer? Some of the finest talent in the Minor Leagues has passed through the Frisco RoughRiders over the last few years. From Rougned Odor to Joey Gallo, as well as the American League’s reigning rookie of the month, Nomar Mazara, there has been no shortage of fresh faced prospects. Many of them finding themselves in the big leagues sooner rather than later. Many top-flight prospects, including Odor (22), Gallo (22) and Mazara (21) are the same age as many college seniors. Yet each have already had a taste of the major leagues, with Odor playing in his third ML season. Frisco RoughRiders closer, Matt Bush, has the pedigree to have an impact at the major league level. He was a former number one draft pick, and has a fastball that registers just south of triple digits. But that’s where the similarities end, as Bush’s journey from can’t-miss prospect to incarcerated criminal is close to coming full circle. Over the past three years, Matthew Brian Bush has spent more time in prison than he has on a diamond. After a minor league career wrought with legal problems, Bush finally hit rock bottom when he ran over a 72-year-old motorcyclist, fled the scene, which got him 51 months in prison. Flashback to 2004 and Bush, a San Diego native, was thought of so highly by the San Diego Padres, that they took him number one overall in the 2004 Major League Draft. To put that in perspective, Bush was taken ahead of former MVP and Cy Young winner Justin Verlander, as well as future All-Stars Jered Weaver, Billy Butler, Homer Bailey, 2005 Rookie of the Year Huston Street, as well as former 20-game winner Gio Gonzalez. And at the time, Bush was a full-time position player, as displaying quick feet and an outstanding arm as he patrolled shortstop for his Mission Bay High team. Although his bat looked to project well, he’d struggle at the dish almost as much as he struggled off the field. Almost as soon as he was drafted, Bush fell into more than his fair share of brushes with the law. Fueled by alcohol, he would commit assault at age 19, rack up DUIs and ultimately almost commit vehicular homicide while in the Tampa Bay Rays organization in 2011. Although the motorcyclist that Bush’s car almost crush survived, he was sentenced to just over four years in jail. This was Bush’s rock bottom, and his stay in prison not only netted him some new tattoos, but also a fresh outlook on life. Bush was released early, and signed a minor league deal with the Texas Rangers on December 18, 2015, his fourth team since his minor league debut with the Padres over a decade ago. When news broke early on Friday that Bush had been promoted to the big league club, it meant not only that a lifelong dream was about to fulfilled, but also that he could now scratch his name off the list of former number one draft picks that failed to make the major leagues—including Brien Taylor and Steve Chilcott. If his time with the RoughRiders is any sign of his future big league success, then the Rangers might be looking at their future closer. In 12 games this season in Frisco, Bush boasts a 2.65 ERA, with five saves (in five opportunities) an 18:4 strikeout-to-walk ratio. Although Matt Bush has had his struggles, he’s more than turned the corner. Now, as a member of the Texas Rangers, he can flip the script on his past problems, leaving his demons in the rearview window. Matt Bush the career miscreant, the kid that despite his skills just couldn’t stat out of trouble, is a distant memory. Now fans of the Texas Rangers have a “new” can’t-miss prospect to count as their own. Say hello to Matt Bush, Major Leaguer. The days are getting longer and there’s tons of spring things to do in Frisco… Like causing a pizza scene, Ladies Night at Vicini, season finale concerts by Odysseus, the Frisco Chorale, and the Youth Symphony Orchestra, plus plant lectures and plays. The year is almost half over, so take advantage of all the awesome activities in Frisco! PogoPass: Get a $124.95 PogoPass for $49.98 when you use code:FRISCO. Get access to some of the most fun venues around town this summer including the Sci-Tech Discovery center, Fort Worth Zoo, Texas Discovery Gardens, and many more. “Vicini Frisco presents Per La Donna” – Starting this Thursday will be our first ladies night we are calling “Per la Donna” – For the lady. $10 gets all ladies a glass of prosecco and a 3 course dinner! Please make your reservations now at Vicini. Starts at 6pm. Must make reservations and it is for ladies only… gentlemen we will see you at the bar! Cocktail and wine specials available all evening! “Once On This Island” – With its poignant story and catchy Caribbean-flavored score, Once on This Island JR. is a theatrical adaptation of Hans Christian Andersen’s popular fairy tale, The Little Mermaid. This full-hearted musical tells the story of Ti Moune, a peasant girl who rescues and falls in love with Daniel, a wealthy boy from the other side of her island. When Daniel is returned to his people, the fantastical gods who rule the island guide Ti Moune on a quest that will test the strength of her love against the powerful forces of prejudice, hatred and even death. 8 performances by the Frisco Youth Theatre in the Black Box Theater. From 7:15pm to 8:45pm, May 13th to 22nd. “Season Finale Concert of the Frisco Youth Symphony Orchestra” – Come join the Frisco Youth Symphony Orchestra for their 2016 season finale. A fantastic program will feature the following works. “Frisco RoughRiders vs. San Antonio Missions” – First pitch thrown in Dr Pepper Ballpark at 7:05 PM. Please Note: Children aged 2 and under do not need a ticket, but must sit on a lap. Get your RoughRiders tickets! “Super Friday Fun Night” – Kids night out at the FAC! Start off in the Zone playing air hockey, billiards, and foosball during check-in. Next, head to the Indoor Aquatic Center for swimming in the lazy river, play pool, and slide down ‘Big Blue’ (must be 48′ to ride). End the night with a pizza dinner and fun, active and cooperative games in our studios and gym. Bring your friends and join us for Super Friday Fun Nights! Drop off in Zone. Guardian must come into FAC with participant to sign a waiver on first visit. Bring bathing suit and towel. “Sacred Lyricism (Season Finale)” – Odysseus North Texas Chamber Orchestra and Frisco Chorale at 8pm in the First United Methodist Church, 7659 Preston Rd. in Frisco. $12 – $16 Advance Purchase and $14 – $18 at the Door. Odysseus North Texas Chamber Orchestra will stage its season finale,entitled Sacred Lyricism, on May 21st in Frisco and May 22nd in Mckinney. The orchestra will be joined by the Frisco Chorale on Schubert’s Mass in G Major, Beethoven’s Coriolan Overture in C Minor and Mendelssohn’s Symphony No. 4. “Chalk Talk Series at Sci-Tech” – Sports Injury & Prevention Presented by Baylor Medical Center of Frisco. This important topic for all athletes will be led by Brian Quesenberry and Allen Russell – Fusionetics Performance and Corrective Specialists from 6pm to 7:30pm in the Sci-Tech Discovery Center, 8004 N. Dallas Pkwy. Learn how to prepare for a higher level of sports through training, conditioning and diet to raise your performance level in a safe and productive way. You will learn how to recognize and prevent overuse injuries. Activities and Presentation is appropriate for age 4 to 40. Reserve your space today online http://mindstretchingfun.org/ or call (972) 546-3050. “Sacred Lyricism (Season Finale)” – Odysseus North Texas Chamber Orchestra and Frisco Chorale at 4pm in the First Baptist Church, 1615 W. Louisian Street. in McKinney. $12 – $16 Advance Purchase and $14 – $18 at the Door. Odysseus North Texas Chamber Orchestra will stage its season finale,entitled Sacred Lyricism, on May 21st in Frisco and May 22nd in Mckinney. The orchestra will be joined by the Frisco Chorale on Schubert’s Mass in G Major, Beethoven’s Coriolan Overture in C Minor and Mendelssohn’s Symphony No. 4. “Frisco RoughRiders vs. San Antonio Missions” – First pitch thrown in Dr Pepper Ballpark at 4:05 PM. Please Note: Children aged 2 and under do not need a ticket, but must sit on a lap. Get your RoughRiders tickets! “Frisco Arts invites you to our first Friends Night Out!” – Enjoy live music, complimentary appetizers and dessert while mingling with other arts enthusiasts in Frisco. In addition, all members of Frisco Arts will receive a $20 gift certificate towards your next dinner visit to Bonnie Ruth’s! Not a member? You can join and become a Friend of Frisco Arts at the event, or visit our website at friscoarts.org for more information on supporting Frisco Arts. From 5:30pm-8:30pm on the patio of Bonnie Ruth’s at 6959 Lebanon Road in Frisco in the Shops of Starwood. Hope to see you there! This event is open to all who wish to attend. “Frisco RoughRiders vs. San Antonio Missions” – First pitch thrown in Dr Pepper Ballpark at 11:05 AM. Please Note: Children aged 2 and under do not need a ticket, but must sit on a lap. Get your RoughRiders tickets! “Art Appreciation Class by ArtitudeArt” – Artitude has been designed for children to strengthen their knowledge of Art, and further develop their art vocabulary skills. We offer acrylic, water color, mixed media, collage and more. Every Tuesday from April 5 – May 31, classes at both 5:30pm & 6:30pm in Frisco Discovery Center, 8004 N. Dallas Pkwy. Each student only $20. “Creative Role Play Academy MERP” – On Saturday, May 28th, from 9:00 a.m. to 4:00 p.m. at St. Philip’s Episcopal School in Frisco, the Creative Role Play Academy offers young adventurers three MERP (Massively Epic Role Play) worlds to start from: the sci-fi- based Galactic Frontiers, the fantasy realms of the Fabled Kingdoms, and the gritty superhero universe of Megatropolis. Participants also get to watch an authentic battle demonstration from a local medieval sword fighting guild. If the adventure of MERP appeals to a kid you know, register for the May 28 MERP through Creative Role-Play Academy and receive 50% off admission. Kids enjoy the experience so much they don’t realize they’re actually uncovering some of their own hidden superpowers. They just think they’re saving the universe! “ARTragious Summer Art Show” – We are very excited to announce that the Visual Arts Guild of Frisco (VAGF) has been approached recently by Ablon at Frisco Square with an “Art Wall” proposal. They would like to display 3 artworks by VAGF members on the rotating basis on the outside wall. No cost to artist and they can even return artworks at the end of period. While they are working out the details, you still have time to take pictures of your artworks and get them ready for submission. Stay tuned; we will let you know how and when submit images. “Music in the Square 2016” – Every Friday evening in June, join us on the Simpson Plaza lawn, in front of City Hall for Frisco Square’s featured summer event, MUSIC IN THE SQUARE. Bring friends and family, grab a picnic, some blankets or chairs, and enjoy listening to a unique line-up of talented musicians Friday evenings this June, between 7:30 and 9:30 PM. Admission is free. “ParkaPalooza” – On Saturday, June 25th, bring your lawn chairs and blankets, pack your picnic, and watch “Hook” in the park with family and friends in the Warren Sports Complex Pavilion. From 7pm to 11pm, a FREE event where kids can work off their energy in the bounce houses before the movie begins at sunset. Movies are subject to change. It’s that moment you dread… An email from the school or a letter in your child’s folder with the word “Lice” staring up at you. It’s usually a warning that there has been a confirmed case in the class or school. Terrifying right? That’s exactly what happened to Beth Kirschener a couple of years back when unfortunately, the little buggers made their way into her home. Following use of over-the-counter pesticides, hiring a mobile service, and many painstaking hours and hundreds of dollars later, the problem was gone. The process was not only emotionally draining, but embarrassing too, as she had to inform friends and neighbors who may need to know. Not long after, her job of 11 years laid Beth off. So, she decided Frisco needed a specialized local service that could take the pain and stress out of dealing with this hair-raising issue. While doing some research, she came across the Lice Lifters organization. Impressed by their thorough process, she was also particularly motivated by its nontoxic, all-natural killing agent. Fast forward a few months and the Frisco office was born! I met Beth and her team recently on-site at their premises just off Parkwood and Stonebrook. Upon walking through the door, you instantly feel a professional, but warm, welcome in a tastefully decorated environment. Beth and her staff are ready to greet the whole family for a full check. Their facilities will make you feel at home. They include FREE Wi-Fi, DVD players, TV’s with family-friendly movies, snacks, and a kid’s playroom with puzzles, coloring books, and chalk boards. While one person has the issue living in their hair, we will also do a full assessment of up to 3 more family members for free,” explains Beth. The process and products promise to kill all live activity in one treatment followed up by an expert comb-out system to remove the nits and prevent them from coming back. To explain it layman terms, a female can lay over 200 viable eggs and their lifecycle is only a short 2 weeks. At this point, the person involved will have a total infestation which is a highly contagious situation. Beth currently has five technicians at the Frisco office and it’s growing. They will open their second office in Southlake on June 1st with Beth’s business partner and Manager, Kim DeJarnette, at the helm. Although not a pre-requisite, the staff all come from a background of cosmetology or hair styling. Their training includes a rigorous step by step examination. Sectioning of the hair and use of a combing technique ensures inspection of every area of the infected head. The patient is then treated using specialist tools, mouse and solution. At the end of the treatment, a second person then also checks the clients’ hair. Following the in-house process, Lice Lifters will provide you with a thorough checklist of procedures to follow. The goal is to ensure complete elimination of lice from you home. In addition, each family takes home a company Certification for your child when returning to school. Lice Lifters offers a free 7-day checkup and a 30-day guarantee. Asking if lice was in any way a seasonal issue that we should worry about just in the school months, Beth was clear we need to be alert all year round. Luckily, lice has not affected my home, but I came away feeling relief knowing Beth and her team are nearby to help should the need arise. Mon – Friday 9am – 5 pm. You can buy products at their office including your own take away Treatment Kit. Anyone attending Frisco ISD receives a 20% discount. They also accept most Flex Spending and Health Savings credit cards.